Capillary-grooves, drip grooves, capilary breaks. Grooves in various building components to stop water traveling uphill by means of surface tension and or capillary action. Capillary action and surface tension allow water to flow up hill. In simple terms a thin film of water, or water in a thin tube or narrow space between two solid surfaces will move against expectations, either uphill or clinging to the underside of a surface. Another manifestation of capilary action is known as wicking. A pourous wick with one end in a fuid will daw the fluid upwards due to capillarh action. In the sketch above a sill block is shown with a groove near the front underside. If the groove was not there water can run off the sloping sill down and clinging to the underside of the block using surface tension run to the wall. From then at the least, overtime it will leave unsightly stain on the wall surface. To stop the problem the groove collects the film of water into a large enough volume so that drops form and they drip off before reaching the wall. This is also called a drip groove. The same applies to the timber sill, where unwanted water can get into unsealed spaces and cause rot and other damage. In the sketch the window sash also has a groove for the same reason. The roof sheeting example is similar, what happens here is that the wider section forms a capilly break that stops futher upward travel. 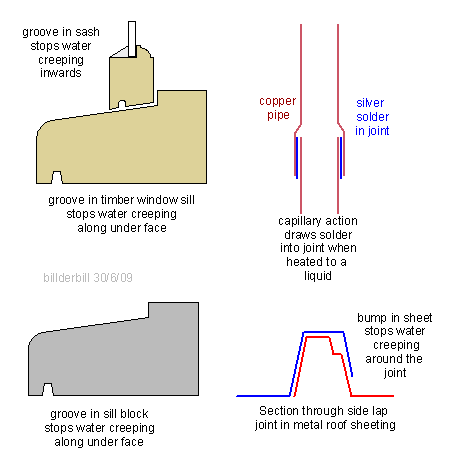 The copper pipe sketch is there to show that capillary action can be beneficial also. This is the reason that a plumber can lie on his back under a sink and solder a pipe joint that would seem impossible to do. Another common problem is with very flat roofs. Metal roof sheeting can be had with a high profile that can be fixed as low as 1Deg. pitch. On roofs less than 5Deg. water runs to the edge and it tends to run back uphill on the underside of the sheet. To stop this we put a turn down on the bottom of each pan in the sheeting. In effect we change the angle of the sheeting right at the very end to sat 10Deg or 20Deg so that the water drops off cleanly.